Only 44% of B2B marketers are clear on what content marketing success looks like. To me, this is incredible, especially as it plays into another finding – only 30% of marketers consider themselves to be effective. Why are you even using content marketing if you don’t know what success is – and how it will help your business move forward? Why is this number so low, and, more importantly, what can marketers do about this? CMI shared the survey results around success and asked our B2B research roundtable to tackle the issue (video below). A big thanks to the participants: Ardath Albee, B2B marketing strategist with Marketing Interactions and author of Digital Relevance; Vishal Khanna, director of digital marketing for Wake Forest Innovations; Carla Johnson, president of Type A Communications and co-author of Experiences, the 7th Era of Marketing; Jeannine Rossignol, vice president of marketing for Xerox Consulting and Analytics Services; and Linda Crowe, vice president, digital marketing solutions of Brightcove. 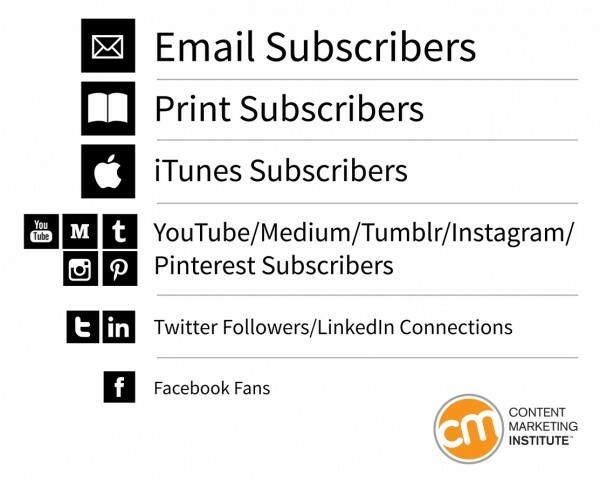 While there is no one right metric to track, many organizations would benefit from focusing on subscribers, which Joe Pulizzi recently discussed in his post No Subscription Goal for Your Content Marketing? Prepare to Be Ignored. Not all subscribers are created equal, either. In the subscription hierarchy below, you can see that email subscribers offer the most benefit because you own the data associated with your subscribers – even though subscribers can always decide if they want to hear from you. This is unlike platforms like Facebook, Twitter, and LinkedIn where your subscribers are tied to that platform. This also completely confirms what we found when I was running content marketing at SAP. We spent a YEAR trying to convert visitors to the site to something the business could value. We tested dozens of approaches. None of them worked. What we finally found was that when we focused on building subscribers, and then followed up with the subscribers with hard offers like event invitations, e-books, other pieces of thought leadership, and even “click to speak to a sales rep,” the subscribers were 10X more likely to convert to a lead. I dug into the report to see if certain groups have a clearer vision of success than others to see if there is any prescriptive advice to offer, and here is what I found. Marketers at small companies have more clarity than those who work for large companies. Marketers who meet with their teams more frequently are more likely to know what success looks like. What is the link between all of these? Communication. So while you need to figure out what success is and how to track it, you also need to communicate it. Get buy-in from management on what they need to see to quantify your content marketing program as a success. Understand what metrics support success as viewed by management. Here is a list of some common goals and metrics. Make it abundantly clear to anyone who is involved in content marketing what success looks like. This includes documenting this criteria – and communicating it on a regular basis. Not only does this keep everyone on the same page, but it also helps people stay on track when roles invariably change. Useful metrics are used by marketing to know if programs are on track. Examples include open rates and click-through rates. Meaningful metrics are those that are reported to the business. Examples include leads in the pipeline, qualified leads, or whatever is important to the business leaders. In short, not only do you need to define or understand what success looks like for management, but you also need to figure out how you are going to track individual pieces of content. via One Obvious Reason Why Content Marketers Are Not Feeling Effective.